We have SO much snow here...so much so that we have ended Sleigh Rides and are switching to sugar season prep mode. Hard to believe that one could have TOO much snow for sleigh rides...but it is the timing of it all. Scott really needs to transfer his energies from snow shovelling and horse-drawn grooming to sugar season prep. He has repairs to do and new equipment to install. Then he will look at tapping in...possibly as soon as mid February!! We've started tapping!! The past couple of weeks were just too cold and stormy. Scott began yesterday. Very cold, very deep snow, some buried lines. It's a bit of a tough start. However, the weather seems to have a warming trend coming up. Scott hopes to be tapped by next weekend. Great day to be tapping...Scott has completed 50%. Tapper broke down today so he lost a couple of hours running into town to MC Power to pick up the spare that was being repaired...then worked til dark. Scott figures that if he puts in a couple of long days he'll finish before the weekend. Maybe put the camp in order on Saturday and be ready if something opens up on Sunday. Of course the first boil is the "prime" for the evaporator. Hope all this goes as planned. Well, the best laid plans...Scott lost a good day of tapping today because he's trying to get the evaporator set up and ready and it's a bigger job than anticipated. Adaptations of the new sap pan and hood, removal of the old smoke stack to make way for the new one being installed with a boom truck tomorrow etc. Tomorrow he'll hopefully complete all that. Then look at next steps depending (always) upon weather. Scott's tending to the horses now after finishing up at the camp. After several hours of maneuvering with the boom truck, and with an audience of kids and parents, the smoke stack went up. Then of course the new steam stack didn't match the existing hole in the roof...so Scott was busy til now. Decided to finish tapping the third (of four) mainlines tomorrow and then finish up things at the camp. At least we'll have 2000 taps done then. Great day at the farm all around - nearly 200 visitors, lots of snowshoers, sugar on snow! Scott spent Sunday putting together things at the camp. Good news - the steam stack lined up. Got it installed yesterday. No sap...the temperatures haven't gotten above +6 here - not enough to wake the trees up. He'll finish tapping this week and be ready for what looks like a temperature spike by the weekend. The sap is running!! But don't get too excited yet...it's not running hard yet and we doubt we'll get enough from this to fire the evaporator up and make syrup; we need at least 800 gallons to do that. But yes...Spring is HERE. Scott finished tapping today! Tomorrow should see him cleaning the sugar camp etc for the weekend. Friday should bring highs of 8. We expect sap. When we'll have enough to boil? We'll see. We expect that at least one day of the weekend will see us boiling. We are boiling tonight! Scott is filling the evaporator and firing up as I write. We had sap running all day here and it actually ran a little harder later in the day. Scott will clean up what he's got and have a chance to try out the new equipment without a crowd watching. Too bad I can't be there to help...haven't really since Samara was born nearly 6 years ago. As she gets older thought, she'll be able to participate more...and so will I! Jordan Post is coming out to help tonight - a new employee who's a recent graduate of Ranger School and grew up with maple. Great to have him and his girlfriend and fellow Forest Technologist Chelsea Taylor working with us this spring! Boiling today. Scott cleaned up last night, home at 1, now we have a tank of sap to start with today. Excellent day. Steady sap run, not huge, unwavering, til mid afternoon. Scott and Jordan boiled from around 11 to 4. Just finishing up now. Good crowds but not crazy. Did sugar on snow inside cause of the rain! Tomorrow they will boil again as we still have a tank of sap. Starting up later morning. Happy Spring!! Had a great day Sunday. The syrup lightened up, Scott and Jordan boiled while the sap ran steady all day. Lots of visitors enjoying the opportunity to taste the 2011 syrup "hot off the press". Sugar on snow all day, snowshoes rented all day. The hiking trail is falling apart a little, rotten snow. However, it's cold this week they're calling for more snow at the end of the week so that will help clean it up. Tonight it's nice and cold - minus 10 - just what we want. Warmer temps called for later this week should bring more sap. So far so good! Tomorrow and the rest of this week we open 12 to 4 for March Break - hope there are lots of folks out. Actually went down to minus 13 last night. Great. We had snow flurries all day yesterday. Now a beautiful sunny bluesky day today! Sunny day, a little sap, but not enough to boil. Still, when we left this afternoon we had 17 inches in one tank and it was still running. Scott plans to boil tomorrow, Thursday, firing up at around 11:30. Hard to tell what the next couple of days will bring. We always adjust the weather forecasts to account for the unique situation we have up here at Sugar Moon, being close to the highest point on mainland Nova Scotia and all. It's always colder up here. Temperatures even vary at the camp, vs up the hill at the house, vs up the hill in the sugar woods. Saturday morning we have a bus load (55) of St FX students arriving right at 9...and then another 48 ESL students later in the morning. Just a heads up! And...still need snowshoes in the woods. After an 8 hour boil, Scott's home and happy with the day. A good run and excellent syrup. The sap is still running a little so he expects they will boil again tomorrow. Check out our FAQ page for frequently asked questions about visiting us during the busy sugar season. Boiled again today, made lots of delicious syrup. Now it's cold and windy and damp. We need warmer temperatures now to get sap and it doesn't look promising for the weekend. Good news...the sap ran today despite the temperatures just getting a couple of degrees above zero. We have about 3/4 of a tank so will boil tomorrow at around 11:30. Anyone from PEI on March Break is welcome to come this week! We have been taking reservations for small groups around the larger groups already booked. Just email me, Quita. We would need to reserve. The sap ran today! Good sign. We actually got a full tank and will boil tomorrow. Another good boil. Scott says it was amazing that we got 800 gallons of sap from that run, despite the temperature only being a couple of degrees above zero. The trees want to run...and we are grateful. Check out the Earltown Maple Festival and Pancake Supper down the road at the schoolhouse in Earltown (Hwy 311) this Saturday from 10 to 6. A great slice of rural Nova Scotia life with sweets, live music and syrup donated by yours truly. Support a great community event that raises money to maintain the historic hall. No news has meant...no sap. However, we are far from done, we hope. We just started making "mid-season" syrup and the weather sounds great for later this week. Perhaps Thursday we'll have enough to boil. Still lots of snow in the woods. We think that this is a good thing and will help prolong conditions and hold off the inevitable end when the buds on the trees swell...this is when the sap doesn't make tasty syrup anymore. Today it's sunny and already warming up. We have 1/2 tank of sap and Scott will assess the sap flow at noon to determine whether he'll boil this afternoon or hold it for tomorrow. We should get more again tomorrow...and maybe Friday too! We are very nearly at the halfway point in terms of production. That's what we want by the end of March. Scott and Jordan are boiling as I write. A good run today, they are cleaning up one tank (800 gallons) while the sap runs into the empty tank. They will likely boil again tomorrow. Great tasting mid season syrup! Yup...another boil. Started running mid morning and was a good strong run. Scott is just finishing bottling. It stopped running this evening...the temperature now is about minus 2. Sounds like it will run again tomorrow...and the crazy weather they are forecasting for tomorrow night means it will either continue running or peter out. We'll see. Scott says the syrup yesterday actually lightened up. We're happy that there is still snow on the ground, insulating the trees. All is good. Scott says..."Despite reaching temperatures of slightly above zero on a couple of occasions over the weekend, the sap didn't run at all Friday and Saturday. However, by about 1 in the afternoon today, with a temperature wavering between minus one and zero, we collected over 900 gallons of sap! It's one of those occasions that underscores the inherent mystery that abides in the living world. We have no idea why it ran, but it did. We'll be boiling tomorrow." Scott and Jordan are still boiling...9 hours after starting this morning. When Samara and I checked in at 7:30, the sap was still running steadily and we had 12 inches in the tank. Delicious syrup with a taste and colour that herald the beginning of the end-of-season. With snow still on the ground, and more cold precip coming tonight and tomorrow, who knows how long this will last? And who knows how long they'll boil tonight? 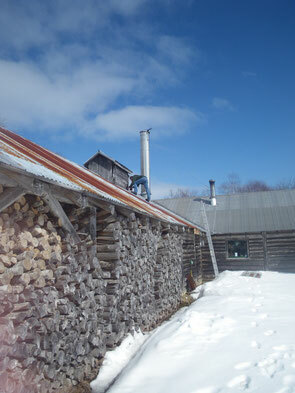 We are so happy to see that our wood pile is dwindling...it's a good sign! We've been making lots of syrup. Tomorrow Samara knows that her birthday celebrations will be determined by the sap. Ah, the life of a "sugar baby"! Sorry...got busy. Monday night they boiled til 8:30, Scott got home at 12:30. Sap was still running at 11:30 pm, enough to boil on Tuesday, sure enough, Samara's birthday. How could it be otherwise? Still...made a cake and had a party with Grandma and Grandpa. Sweet day for a sweet girl. We've been collecting sap since then but not much. The trees need a nice cold night. Tonight might do it, but tomorrow may not be warm enough. Sounds like Saturday will be. My bet? A Saturday boil. We'll see...! Good weekend to come out. Supposed to be sunny, warmer. No big groups booked. We're boiling tomorrow...starting late morning. Yay! Great boil today with Bob. Sap ran again and we'll do it all again tomorrow. Tasty syrup! Folks enjoyed Rogart Trail without snowshoes today, despite the snow in the woods. It was cold enough to walk right on top. Yep. Snow. NOTE we will close the restaurant early on Saturday April 16 (3 pm) in order to get ready for Chef's Night that night. We boiled Sunday with Bob again...great dark strong syrup and lots of families checking it all out. Then we were able to boil again Monday, just a short one. The sap hasn't run since then...and we don't expect any til perhaps Saturday. The trees have not budded up here, there is still lots of snow in the woods, and the temp is supposed to go to minus 10 Friday night, so maybe we will get one last "kick at the can" this weekend. Beautiful sunny day here! Got cold alright last night so we'll see what the trees decide to do today. Well, we didn't get any sap Saturday...and Scott declared our season over. The trees decided that they had given enough sap. We were slightly sad, as usual, but ready now to move on to clean up and spring activities. Production was average, but it was only the second time in eight years that we've been able to do that...so all in all it's been an excellent season! Scott and Jordan started cleaning the tubing in the sugar woods this week before the rain came. Then comes camp and evaporator clean up. Tonight we have our "end of season" staff party with close to 20 staff laughing, eating and reminiscing about a great season over traditional Italian Food by our hostess, Vivian, and organic greens from Green Dragon Farm - yum! And now we are getting ready for a busy Easter weekend - we'll have lots of families out for brunch, sugar on snow, sugar camp tours, spring hiking and maple syrup and other goodies. We're open Fri/Sat/Sun/Mon 9 am to 5 pm (restaurant serves til 4:30). Then next weekend comes Saltscapes Expo where Scott and Eriel will be meeting and greeting thousands of enthusiastic folks and selling maple goodies and giving maple tastings. Saltscapes is the one show we do all year and we think that it's great. Thank-you to all of you who have followed this sap journal! And thanks from Quita, Scott and Samara and family and staff to all who continue to visit and support Sugar Moon Farm. Come see us again this year! We continue to be open every weekend year round and every day in July and August, and we have lots of great activities coming up: Chef's Nights, Scottish Living History Performances in May and throughout the summer, a Children's Nature Day in June and Strange Adventures at Sugar Moon...and more. Sign up for our email contact list to receive regular updates about everything at Sugar Moon.